AEA providing engineering services to the New Jersey Turnpike Authority (NJTA) for design of electrical and lighting upgrades to the southbound Great Egg Harbor and Drag Channel Bridges. 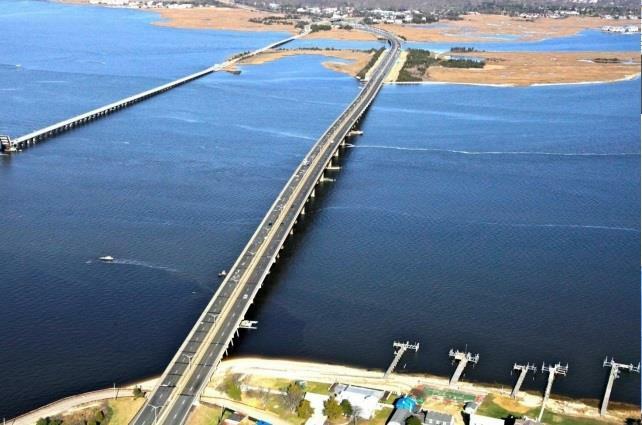 The project included the construction of two Garden State Parkway Southbound bridges over the Great Egg Harbor and Drag Channel Island. The project spanned about 1.8 miles of both the Northbound and Southbound roadways. The two bridges are also to carry a multiuse path for cyclists and pedestrians. AEA provided design and construction support services for Roadway Lighting, Multiuse Path Lighting, and Navigation lighting. Also AEA designed for the relocation of one CCTV Camera and one Video Transaction Data Multiplexing (VDTM) Camera located near the toll plaza. AEA performed field investigations to study the condition of existing lighting facilities. Information from the field investigations was used in lighting and power distribution design. AEA performed photometric calculations for the Roadway Lighting using the NJTA design criteria. LED luminaires were utilized for Roadway lighting facilities owing their low maintenance and low power consumption properties. In addition, AEA performed photometric calculations for the Multiuse Path using Illuminating Engineering Society (IES) guidelines. AEA designed Navigation Lighting facilities as per US Coast Guard guidelines. LED luminaires were utilized in the design. AEA designed the power distribution plan for Roadway Lighting, Navigation Lighting, and Multiuse Path Lighting facilities. The power distribution design included but was not limited to Voltage Drop Calculations, short circuit analysis, and power calculations for sizing of Over Current Protection Devices, wires and conduits. Also the power distribution design included removal of existing power distribution panels, installation of new distribution panels, and relocation of utility power metering equipment to the outside of the Electrical Room at the Great Egg Toll Plaza. Electrical work was staged.